Private Studio Situated Next To The Pool, Set In A Lovely Garden in Provence. Property 2: Private Studio Situated Next To The Pool, Set In A Lovely Garden in Provence. MILL OF CHARM in Provence overlooking a beautiful river. Property 6: MILL OF CHARM in Provence overlooking a beautiful river. Genuine Provencal Shed restored stone. Property 16: Genuine Provencal Shed restored stone. Independent gîte for two: countryside and quiet, only rental of the property. Property 17: Independent gîte for two: countryside and quiet, only rental of the property. Cotignac. Pretty stone cottage in 2 acres.Totally private heated pool, min 25°C. Property 24: Cotignac. Pretty stone cottage in 2 acres.Totally private heated pool, min 25°C. 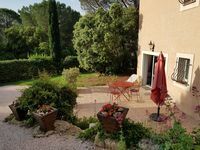 THE PATIO at the Mas des Bouteillans is a charming cottage in a farmhouse in Provence ..
Property 25: THE PATIO at the Mas des Bouteillans is a charming cottage in a farmhouse in Provence ..
Gite on a nursery, very quiet and planted with large private pool. 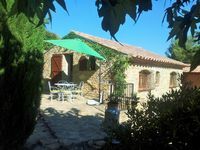 Property 29: Gite on a nursery, very quiet and planted with large private pool. Between sea and mountain: calm, tranquility, full nature! Property 32: Between sea and mountain: calm, tranquility, full nature! Lovely cottage in private property in beautiful surroundings, own swimming pool. Property 37: Lovely cottage in private property in beautiful surroundings, own swimming pool. AGRICULTURAL FIELD OF ORGANIC CULTURE - Comfort and absolute calm - Gite "TURQUOISE"
Property 39: AGRICULTURAL FIELD OF ORGANIC CULTURE - Comfort and absolute calm - Gite "TURQUOISE"
Very clean, quiet and comfortable accommodations. Well appointed with everything you need. Close to some great hiking. Hostess was very sweet and helpful!